Resilient Seated Butterfly valves and High performance butterfly valves keep the snow falling. When Mother Nature fails to deliver the snow necessary for skiing and snowboarding, it’s up to snow-making machines to deliver the stuff that keeps the outdoor sports enthusiasts coming to the slopes. This machine-made snow allows recreation areas an earlier start and a longer season, ensuring a continuous, profitable operation. Snow making begins with a water supply which is pushed up a pipeline on the mountain using very large electric pumps. This water is distributed through an intricate series of valves and pipes to the trails that require snow making. The next step in the snow making process is to add air using an air plant. This plant is often a building which contains electric or diesel industrial air compressors. The air is generally cooled and excess moisture is removed before it is sent out of the plant. Some systems cool the water before it enters the system which improves the snow making process, the less heat in the air and water, the less heat that must be dissipated to the atmosphere allowing the water to freeze. From this plant the air travels up a separate pipeline following the same path as the water pipeline. 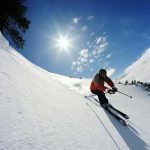 Many ski areas can convert over 5,000 gallons per minute of water into snow, the equivalent to a truckload every minute. Resilient seated butterfly valves and high performance butterfly valves are critical to these snow making efforts. ST Series resilient seated butterfly valves are typically used on air compressor discharge pipes and for on-mountain pipeline branch shut-off duty. The ST Series can be equipped with a manual handle or pneumatic or electric actuator . The ST series is a resilient seated 125/150, ductile iron wafer style or lug style butterfly valve available with either BUNA-N or EPDM seats and 316SS discs. High performance butterfly valves are used on water pump suction and discharge lines and as on-mountain pipeline shut-off valves. 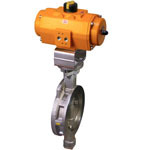 The HP Series is a high performance soft seated, metal seated, butterfly valve. Body material is either Carbon steel or 316 Stainless Steel. Connections are either wafer style or lug style and are either 150 or 300 lb. ANSI rated. They can be equipped with a manual handle or with pneumatic or electric actuators. The next time you are out enjoying the slopes, take a moment to consider the effort that went into the snow making process. Snow making is truly an art form combining science, engineering and technology. This entry was posted in Latest News and tagged Actuated Butterfly Valves, Butterfly Valves, butterfly valves for snow making, High Performance Butterfly Valve, High Performance Butterfly Valves, Resilient Seated Butterfly Valve, Resilient Seated Butterfly Valves, snow making technology. Bookmark the permalink.